Internet Girl that's what family and friends call Raima Sen, the dusky beauty from Kolkata. 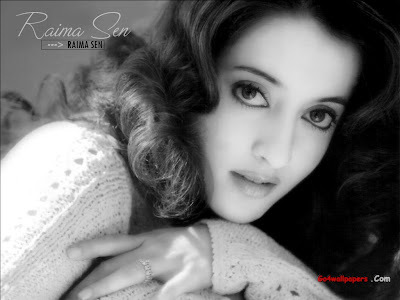 Raima Sen daughter of 'Munmun Sen' and Sister of 'Riya sen'. Her debut film was Bachelors directed by Ajai Sinha. It that she had a lead role and co-star with her sister Riya Sen.
After that she had done a science-fiction Film Fun2sh which zooms into a prehistoric era. She personelly feel not to be a stereotyped actress. She also done many bengali films. Recently Raima Sen, wowed the audiences with her naïve but sensuous biwi’s role in Choker Bali playing the ‘wronged wife’. Her forthcoming film is off-beat thriller tittled 99.9 FM directed by Sanjay Bhatia. She plays the biwi of Shawar Ali, who is a popular radio jockey. Predictably, the hubby is drawn towards another woman Dipannita Sharma.